San Francisco Rush 2 was a racing game for the Nintendo 64, and it did city racing well. That said, I never did all that much actual racing while playing. Not once I discovered there was an obstacle course for stunts nestled among all the other tracks, and that it was a total blast. 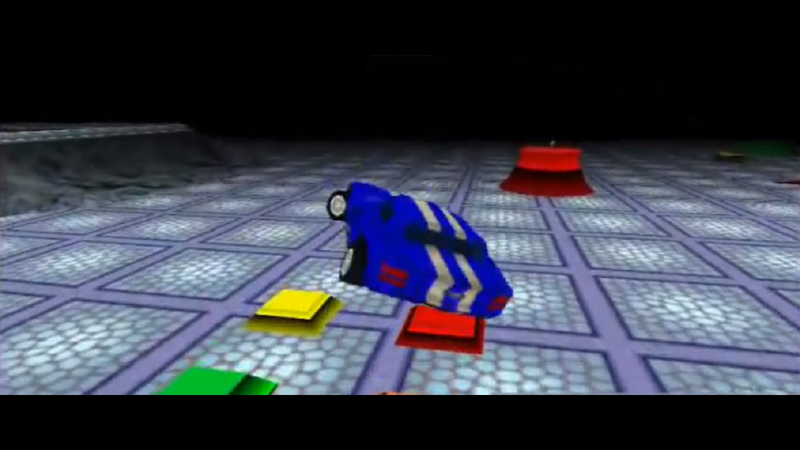 One of the things that made the Rush series stand out at the time was its combination of involved rough-and-tumble physics with vehicles that could blow up. There were plenty of chances for cars to soar through the air, doing flips and rolls in the meantime, but that also introduced plenty of peril. That all practically begged to get bolted to a mode where pulling off wacky tricks without crashing and burning was awarded with points! What I didn’t realize back then, and am only finding out now, was that this actually had roots in the Rush series’ first console game. Apparently, in one of the tracks, by going out of the bounds of the course, you could find a secret tunnel leading to a secret underground arena. In retrospect, it’s apparent that the sequel took that fun little diversion and turned it into something a bit more robust. That was a wise move. The series did not just stop there with the conceit, either. In the game that came next, San Francisco Rush 2049, they expanded that single-course side activity into a full-blown, fully featured stunt mode. Multiple tracks that get unlocked in sequence, a deepened score system including bonus multipliers—the works. It was also the perfect muse for 2049's big futuristic gameplay addition, a pair of retractable wings that could fine-tune a car’s landing...or, less boringly, rotate at nauseatingly breakneck speeds. I swear they got put in specifically to enrich the stunting possibilities. Not only were they an able resource for giddy chaos, but they also made it possible to control the landing. Not make it easy! That would be no fun. But at least allow successful tricks to not be left entirely to the whims of chance. That was a godsend. It led to the best stunt mode present in the series. It also naturally meant that by extension, San Francisco Rush 2049 was my favorite of the three console games. All because of factors that had nothing to do the racing aspects of a racing game. Funny how that works out! I’m sure I am not the only one who knows a game or three with diversions that eclipse what was supposed to be the main game. Is there anything you’ve played which would fit the bill as well? Not that I can attest to them myself, but Gwent or Assassin’s Creed IV’s pirate ship action both ought to be likely answers, considering they’re getting spun off into whole games of their own and such. Personally, I’ve got to also give a shoutout to the unexpectedly fantastic Desert Island Escape minigame in Animal Crossing: amiibo Festival, which was so good that it later got added to New Leaf in its Amiibo update so that many more people could have the chance to witness it.